-Whoa. 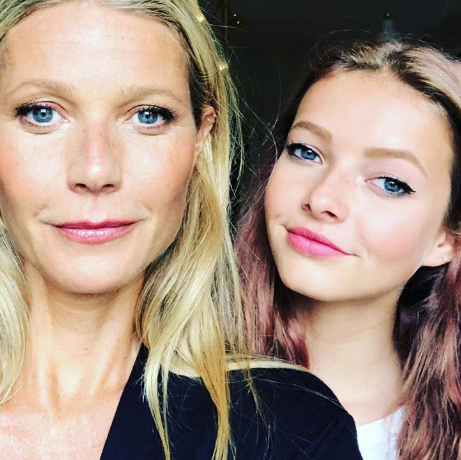 Gwyneth Paltrow and Chris Martin‘s daughter Apple is a stunner. I wonder if this post was her unofficial public debut? GP has always been very resistant to post her kids’ faces. -That collective gasp you just heard came from royal watchers when Meghan Markle dared to close her own car door. –Cardi B and Nicki Minaj‘s drama is far from over. The latest development? A trending hashtag called #NickiStoppedMyBag. -Also, Taraji P. Henson does a solid Cardi B impression. -This interview with TV writer Alan Yang is great — but the best part is when he talks about how insane Secret Santa got on the Parks and Recreation set. -Speaking of Parks and Rec alums, Rashida Jones has reportedly welcomed a baby boy with Vampire Weekend’s Ezra Koenig. I didn’t even know they were dating, let alone expecting. -Today is all about undercover pregnancies! Rachel Weisz gave birth to her and Daniel Craig‘s first child. –Rihanna can’t catch a break. Her mansion has been broken into for the second time this year. -You know what’s nuts about this photo of JLo’s muscles? She’s keeping her hand soft, which means she’s not even hard flexing! I’m so jealous! -Comedian Ted Alexandro went to Louis C.K.’s old stomping grounds and tore him up. -I love that Leighton Meester‘s comedy skills are highlighted in every review I’ve read for Single Parents (aka the only new sitcom I have any interest in checking out). -Interesting to see critics pushing back at Jonah Hill’s directorial debut Mid90s. I haven’t seen it but it was met with rapt applause by male critics at TIFFs — but female critics seemed less impressed. –Steve Carell suddenly looks like a thirst trap and everyone’s confused. -Survivor is now open to contestants from Canada, in case any of you are interested and/or crazy. -The only things I know about these characters are from silly CW superhero shows, but I’m very here for Jurnee Smollett-Bell to play Black Canary and and Mary Elizabeth Winstead to play The Huntress in the Birds of Prey movie. -The Tea with the Dames trailer is hella cute. -Oh wow, the trailer for Creed 2 looks so, so good!